A black leather biker jacket and blue jeans are a nice pairing to carry you throughout the day and into the night. If you're puzzled as to how to round off, a pair of Miu Miu Embellished Cap Toe Flats is a fail-safe option. This relaxed combo of a black leather bomber jacket and grey ripped skinny jeans is very easy to throw together without a second thought, helping you look chic and ready for anything without spending too much time rummaging through your wardrobe. 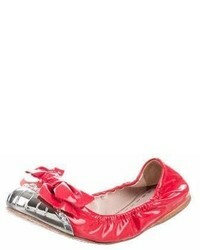 Miu Miu Embellished Cap Toe Flats integrate brilliantly within a multitude of combos. For a neat and relaxed ensemble, go for a white leather biker jacket and a navy polka dot casual dress — these two items play pretty good together. Miu Miu Embellished Cap Toe Flats will be the ideal complement to your outfit. If you're after an off-duty yet incredibly stylish outfit, wear a burgundy print crew-neck t-shirt and light blue ripped jeans. Complete your ensemble with Miu Miu Embellished Cap Toe Flats and you're all done and looking stunning. A white dress shirt and black shorts are a wonderful pairing to have in your daily arsenal. Enter a pair of Miu Miu Embellished Cap Toe Flats from TheRealReal into the equation to easily bump up the street cred of this look. This getup with a red bodycon dress isn't super hard to achieve and is open to more sartorial experimentation. Tone down the classiness of your ensemble by finishing off with Miu Miu Embellished Cap Toe Flats from TheRealReal. A multi colored floral tank and a mustard pleated mini skirt married together are a total eye candy for fashionistas who appreciate relaxed styles. When not sure as to the footwear, introduce Miu Miu red leather ballerina shoes to the equation. One of the coolest ways to style out a white dress shirt is to pair it with tan shorts for an off-duty look. Miu Miu Embellished Cap Toe Flats are an effortless way to add a dose of casualness to this outfit. If it's ease and functionality that you're seeking in an ensemble, pair a white lace long sleeve t-shirt with a red skater skirt. Our favorite of a ton of ways to finish this outfit is a pair of Miu Miu Embellished Cap Toe Flats.